Turn your PDFs into Word documents you can edit. PDF-to-Word converts PDF files into Microsoft Word documents. PDF-to-Word preserves the text, layout and images of your original document. PDF-to-Word instantly converts PDF files into Microsoft Word documents that look just like the original - complete with all formatting and images! Information is set free - free to be edited and free to be integrated into your documents. 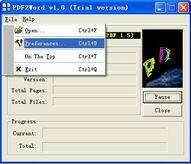 PDF-to-Word software is a standalone program and does not require Microsoft Word, Adobe Acrobat, or even Acrobat Reader. PDF-to-Word is a batch PDF Converter that you can convert a lot of PDF files to word documents once time! saving your time! While VeryPDF's PDF-to-Word and PDF-to-RTF conversion tools make it easy to repurpose an entire PDF document, there may be times where you only want to reuse certain types of content (for example, text or images) or small sections of a document. VeryPDF simplifies the process by enabling you to quickly export all text content to a single text file, which can then be reused in other programs. You can perform a similar task with images, exporting each image as an individual file having the format and resolution you specify. Fully-formatted paragraphs. Easily generate files with well-formatted, correctly-justified, and properly-flowing paragraphs using our unparalleled conversion technology. Reuse scalable drawings, shapes and vector graphics. Convert vector-based images into scalable objects in Microsoft Word, wherever possible. Reliable text exporting. Convert all Unicode-based text, from any language. Recover non-standard encoded text with our advanced optical text recovery technology. PDF-to-Word is a standalone software, MS Word, Adobe Acrobat and Reader NOT required! Software to convert PDF files to Word document from VeryPDF.com Inc. will convert PDF files to Microsoft Word format with a minimum loss of original information. We're here to provide you with not just another PDF files converter, but with software that will make your everyday individual or office work more effective.